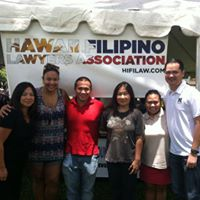 HFLA is once again co-sponsoring the legal clinic at the 26th Annual Filipino Fiesta at Kakaʻako Gateway Parks on Saturday, May 5, 2018 with the HSBA Young Lawyers Division. We are looking for volunteers for our legal clinic booth to educate the public through free legal information. Please pass along this message to friends and colleagues who might be interested and encourage them to sign up! 2 volunteers from 9:00 a.m. to 11:00 a.m.
2 volunteers from 11:00 a.m. to 1:00 p.m.
2 volunteers from 1:00 p.m. to 3:00 p.m. If you are interested in volunteering, please click here for the volunteer sign-up sheet. Further instructions will be sent out to volunteers as the date of the Fiesta approaches. We highly urge your participation, as this event has provided a lot of positivity from the legal community, the Filipino community and the public at large. For more information about this year's Filipino Fiesta, click here.